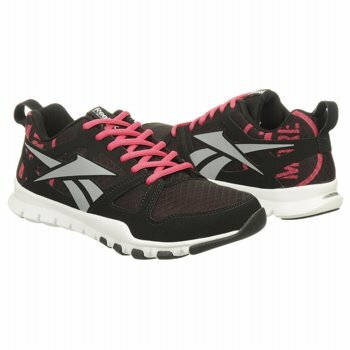 I noticed right away with my shopping experience, that Reebok was a lot like other brands this season, in that all of the shoes were BRIGHT! Pinks, blues, oranges, and greens are the "in" thing, and while I think it's really cute for my kids, I wanted something a bit more subdued. I did found a beautiful pair of black and hot pink runners/trainers at the Famous Footwear website and had those shipped to my door. I owned a pair of Reeboks over 10 years ago, so I didn't know what to expect in the way of fit. These kicks are comfy, however, and very, very light. As a pregnant lady, my feet swell, so I was tempted to buy a wider size than I normally do. I stuck with my traditional size, however, and they really stretched and gave way for my feet. I was happy not to have to return them! My kids each get a pair of new shoes for the school year, so it felt like a treat to get a pair for me. I often buy fashion shoes or shoes for special events. I couldn't even tell you that last time I got a pair of athletic shoes for the performance factor, not for fashion. These shoes, however, fit snugly, don't pinch, and feel like I'm wearing nothing -- they aren't clunky like the athletic shoes I wore 10 years ago. I would totally buy another pair when these wear out, and my experience shopping online at Famous Footwear was a good one!